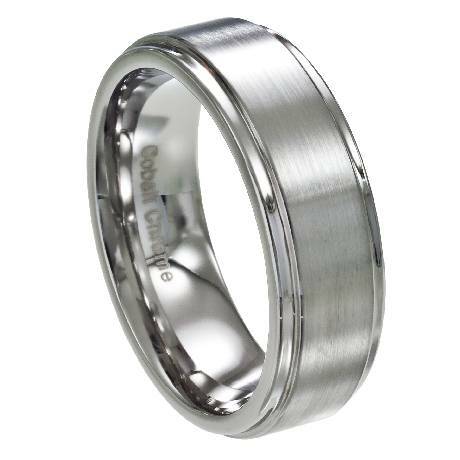 Cool and professional, this sleek men's cobalt chrome ring is a contemporary masterpiece. It features a satin finish with step-down edges that are polished to a brilliant shine. Cobalt chrome is an incredibly strong and durable metal that makes an affordable alternative to platinum. 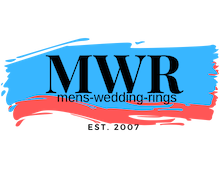 Men who want a ring that exudes confidence and good taste will appreciate this 8mm comfort-fit band. Comfort-fit rings should be ordered 1/2 size smaller! This ring arrived and we both instantly fell in love. It was manly but had a nice sleek look to it. Not too heavy or overbearing. Highest quality, comfortable fit and good weight. Well worth the MSRP but a steal at the sale price! Easy return on the first one I mistakenly ordered too large but great customer service equals a very satisfied customer. Buy here with complete confidence!!! This ring is gorgeous. My fiance loves it. It's shiny, thick, heavy, and very substantial. I am so impressed with it. The only thing... he was sized as a 11.5, but he wore a 10 in this ring.